"The Light Infantry had been introduced largely through the exertions of Sir William Howe shortly before the American revolution, to provide each regiment with a corps of skirmishers. Good marksmen of light build and active temperament were required for the service. Thus the Grenadiers and Light infantry had come to constitute the picked men of the regiment. During an engagement they were usually placed in the flanks, and were hence known as 'flank companies'. In an army it was customary to form them into one or two special battalions in order to make their combined strength available for work requiring the highest courage and skill. 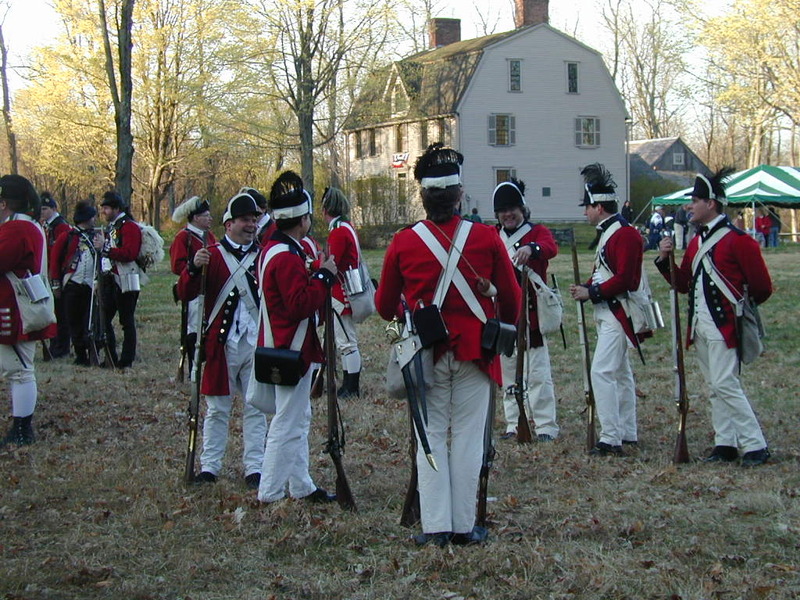 For example it was the flank companies of the garrison of Boston that Gage despatched to Lexington and Concord. At the Battle of Bunker Hill the Grenadiers flanked the British line on the left and the Light companies on the right. When Howe landed at Staten Island in 1776 he organized the Grenadiers into a reserve and grouped the Light Infantry into three batallions. During Burgoyne's expedition in 1777, the Grenadier and Light Infantry companies were formed into an 'advanced Corps' under General Fraser. At Freeman's Farm , 7 October 1777, the Grenadiers and Light Infantry were disposed on the flanks of the British line… many other illustrations of this sort might be given." Light infantrymen wear shorter coats, and carry less equipment, to enable them to deploy rapidly. Notice the hats that are brimless. Painted white on the face of the cap is the the script "L I" for Light Infantry. The Light Infantrymen utilized a drill that differed from Battalion usage. Whereas the Battalion men wheeled mechanically, and deployed on the battlefield in blocks, the Light Infantryman was trained to run in file, often over difficult terrain such as dense woodland in which it would be difficult to deploy serried ranks of battalion soldiers. A file of Lights would progress with the officer at the front, and when the officer turned, the file would turn without command. A file could 'form front' much more rapidly than battalion, and they could 'retire' rapidly as well. As a force, they were very flexible, and could be put to formidable use. In the days of standing armies, they were used in a fashion that has much more in common with current army battle practices.